The arms and wooden lattices which are covered with cloth when greater speed is desired or the wind is weak. The walls of the cone-like trunk are while-washed. The door and the small windows are edged in blue or red. The whole is covered by an onion-shaped dome ending in a point. That is what the picturesque windmills of Graciosa are like. Flapping their wings at the tops of hills, particularly in the Praia area, they can be considered the true symbol of the island. The outline and shape of these windmills recall those which for centuries ground flour or pumped water in the fields of northern Europe. But is their origin connected with the presence of Flemings in the settlement of the Azores? The answer to this question is neither simple nor positive. It is known that in the Azores wheat was formerly ground by water-mills where streams existed or by mills where the stones were moved by patient oxen or donkeys. These mills - which are still in operation in some islands - were a royal privilege entrusted, as a reward, to the captains-donees and nobles. It was only with the end of absolutism in the early l9th century that milling was freed from feudal rights and made tax-free. 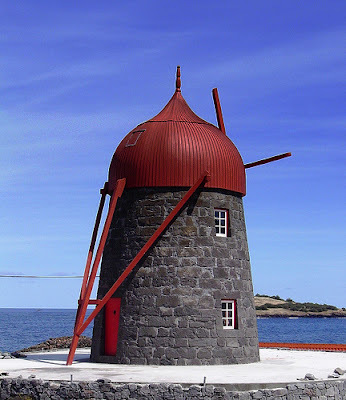 Researchers believe that the first windmill was built in 1818 at the initiative of a priest on Terceira island. Others followed and the windmills spread all over the archipelago, except for the island of Flores where there are many water-mills. The windmills used in the Azores vary from island to island. On Graciosa it is the dome that is moved to accompany the direction of the wind, using for the purpose a long wooden pole that almost touches the ground. On Faial, for example, it is the whole body of the windmill, built of wood and other light materials, that rotates on the stone tower on which it is based. The enigma of the origin of the windmills of the Azores therefore remains But the windmills fit so well into the green landscape that they deserve to have been there at the very beginning, awaiting the first settlers.